I was fairly certain that an offshore development company with majority of their staff in St. Petersburg, Russia was the best choice for a large scale initiative for my company. The decision came after complex vendor selection process which included on-site visits, marathon interviews, long and pricy MSA negotiations, etc. I hang up the phone after final discussion with the CEO and smiled. I liked the team in Russia, some of the guys I met there were at par with my best developers in-house, I was happy with the location as it was offering a cure for my nostalgia, and I was proud to be able to deal with the biggest obstacle I faced on the day one of the negotiations – substantially higher rates of developers in Russia comparing to those in India. “Why work with India if you can find more expensive developers somewhere else?” is not exactly the question you want to be discussing with BoD or your executives. My convoluted negotiation scheme has paid off. I was quite happy with what I was able to squeeze out of the vendor. There were only a few formalities to take care off and I would move forward with the project. I have t ell you – having had set my eyes on the Russian vendor I had to stick my neck out a great deal. There were plenty of concerns with outsourcing in my organization to begin with, moving it to Russia was a challenge of a much high caliber. “If the creator had a purpose in equipping us with a neck, he surely meant us to stick it out.” [Arthur Koestler] Those are the words to live by. I was selling idea of using the Russian team as there was no tomorrow. My efforts were paying off on that side as well – I had full support of my executive team and was ready to move forward with the contract and a very hefty budget. Never come to the finish line of selection process with a single vendor in mind. Make sure that your short list has at least two, better three capable companies. Do not rely on your intuition (bias, preferences, etc.) when selecting the vendor; let the facts, spreadsheets and team consensus drive the decision. 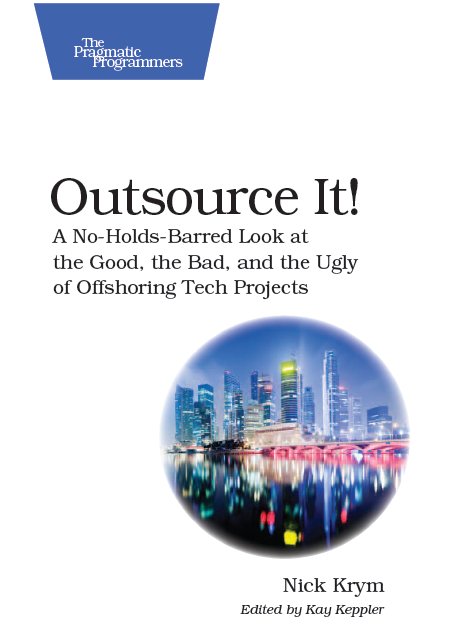 Do not oversell your team, company, and execs on the benefits of outsourcing and especially on any specific vendor. Remember no matter how low you set the expectations your offshore vendor will easily fail them. Do not get lost in complex gambits and convoluted negotiation schemas. And the most important, do not try to pay the vendor less than they can generally get in the open market. The last bullet deserves special attention as a fair rate is a moving target and depends on many aspects and circumstances. I guess that will be my next post. No matter how well traveled you are be beware of dining experiences. The dangers come in all shapes and forms, literally. Many of my friends were knocked down by local foods while vendor shopping especially in China or India. My friend Boris, VPE of a successful Silicon Valley startup, was out for two days after savoring jellyfish dinner in China, another friend was hard down for almost a week after lunch at McDonald’s in Moscow. I heard that asking for simple local food (something they know how to cook) works well. I also heard that asking for “food that an American can eat without getting sick” gets the message across. I tried those as well as many others and can assure you that none are fail-proof. My latest memory is a low key dinner in Bangalore, where my hosts were quite accustomed to guests from the states. Everything was beautifully served and spiced to a perfect degree; no surprises and no concerns. After the dinner the waiter brought a plate with leaves wrapped into small pouches. My hosts all gabbed one of those and suggested that I do the same – “it’s like a mint candy”. I guess “like” was the key word there, a second later I learned that biting the green pouch feels like drinking Listerine out of fire hose. Luckily I knew the way to restrooms which I covered in just a few jumps. Shopping for an offshore vendor is unforgettable experience even if you are looking for relatively small contract. Where else an IT manager would be a subject to such royal treatment? Every time when I face a dubious pleasure of vendor shopping I keep reminding myself that it is probably one of the best parts of outsourcing. And there is always something fun to remember about those trips. Not long ago I was in Pune, India meetings with Satyam – one of the top tier outsourcing firms. The lobby of Stayam’s office was decorated with welcome slogans, flowers and colored sand “paintings” on the floor. There were four of five executives greeting me, all holding high positions in the company. They shook my hand with impressive enthusiasm. A few women dressed in saris welcomed me with large bouquets of roses. While a photographer jumped around taking pictures of this one-of-a-kind event one of the execs whispered in my ear that this was unusually flamboyant greeting that they only offered to utmost important guests. After a few more awkward moments we moved to the conference room with maybe 20 execs and managers. The power point parade began after 30 minute round of “quick” introductions. 15 min into presentation I noticed that older execs started to fall asleep, most with their eyes opened; the skill I always wanted to master. A couple hours later I was exposed to more glorious aspects of the company history and abilities than one can possibly tolerate. By that time I knew for sure that no company in the world comes close to Satyam in terms of quality of the resources, ingenuity of leadership and reliability of its management. Speaker after speaker we were moving down the agenda of what was called out as a brief discussion of the company’s capabilities. Lunch, a buffet of monumental proportions, was a welcome break then an hour later and a few pounds heavier I was back to the power point water-boarding. But I was adapting, it seemed that finally I was getting the grip on the art of sleeping while actively participating. Unfortunately the photographer woke me up. He brought me a CD with my pictures. I put it in my laptop to bring back fading memories of the morning. Here they were: the lobby, execs, saris, roses… Alas, the victims of the greeting ceremony were two strange guys wearing suites and all American smiles. For some reason I did not feel that special anymore. Yet so happy as that little excitement saved me from immanent death by power point.